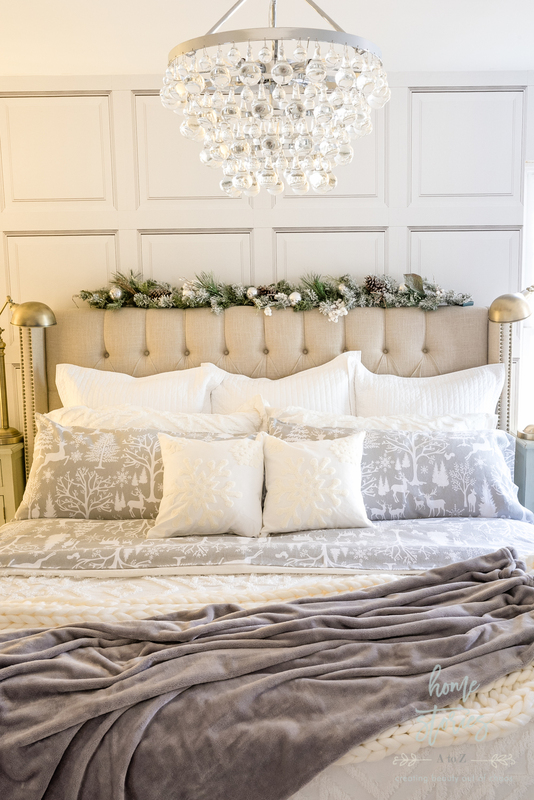 Welcome to my woodland Christmas bedroom decorated in soothing neutrals and winter whites! I’m so glad you stopped by today to tour our Christmas bedroom! 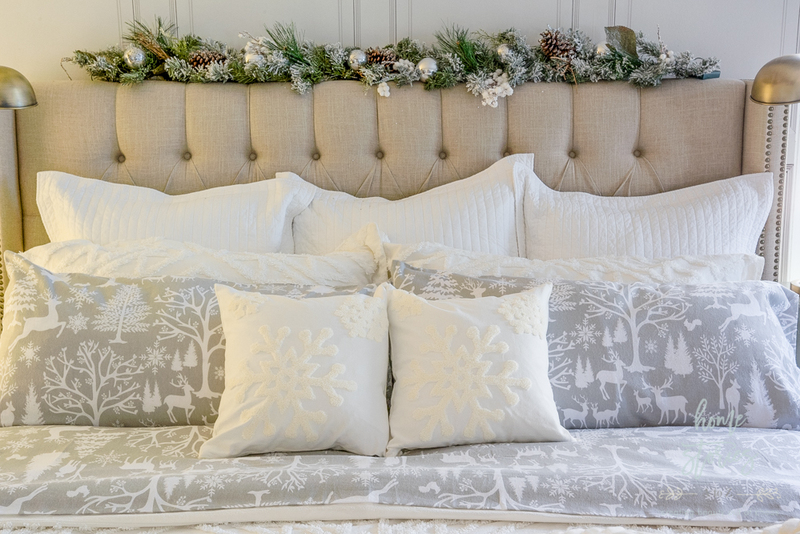 At the end of the post you’ll find links to 15 other bedrooms all decorated for Christmas. Be sure to check them out and get ready to be inspired. If you don’t currently have a Christmas tree in your bedroom, you may just find yourself wanting one after taking the tours! I will try and list all of the sources for my bedroom throughout the post. Feel free to click on any of the affiliate links to shop products that interest you. The inspiration for the the entire room came from these cute gray flannel, woodland sheets from Amazon. The sheets come in several different patterns and are incredibly affordable and comfy! I love that I’ll be able to use them all winter long. I typically like to keep our bedding white but enjoy adding various touches of texture and color as the seasons change. My white chenille duvet is a Better Homes & Gardens at Walmart find that is perfect for winter. The texture is gorgeous and I love that it’s a heavier weight for winter. My white Euro shams are also from BHG Walmart. I placed a faux garland from HomeGoods across the back of our bed and a tree from Lowe’s in the corner of the room. This is the first year in our current home that I’ve set up a tree in the bedroom and I’d forgotten how much I love it! It makes reading at night or cuddling up with Netflix (and chill *wink*) a dream! The throw blankets at the end of the bed are perfect for napping and just looking cozy! They are both Amazon finds. The gray pom pom throw is only $17 and very soft! The chunky knit throw made my Favorite Things list this year and is pricier splurge at $80. It’s currently my favorite blanket in the house. I kept the decor on our nightstands very simple and just added some mercury glass and bottle brush trees to continue the woodland theme. Thanks so much for stopping by today to tour our Christmas bedroom! If I missed a product source that you’re interested in, please scroll through the pictures below for more bedroom sources. I love the bedroom and how that big chandelier shines on top of everything. That Christmas tree makes it look even more magical. WOW! This is gorgeous! LOOOVVVEEE your gray wintery sheet set! I bought a snowflake quilt set last year, and I really love seeing it out. 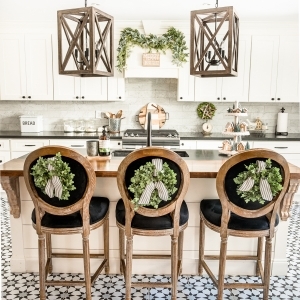 Makes me feel a little extra cheery, as I am sure this beautiful room does you. Thanks for sharing! Beth your bedroom looks beautiful!